Summer is the perfect time to encourage kids to read books and hopefully love it too! I’ve created a fun summer reading program for kids that you can use right at home and customize to your own family. There’s even a free printable chart! I grew up with my nose always in a book, thanks to my mom and grandma passing down their love for reading. But I distinctly remember one thing that help to really foster that love of books – a summer reading program at our local library. We earned coupons for free ice cream cones as a reward for reading and the more we read, the greater the reward. My siblings and I really wanted that ice cream, so we read a lot. It was great incentive for kids and it was simple for my mom. Now that I have my own kids, I’m hoping to pass down that love of reading to another generation. So far, Nathan’s been bitten by the book bug (he devours books like there’s no tomorrow) and Emily is fast behind him. The town we used to live in didn’t have a summer reading program. Technically they did, but there was no rewards – “the reward was reading itself” the library said. Um, that’s kinda lame when you’re trying to encourage our tv-video game-internet addicted culture to foster the love of reading. Let’s face it – kids, just like us adults, need a little motivation! So my husband and I made up our own little summer reading program for the kids with a simple chart and reward system. Our kids loved it. And I loved how simple it was. This year, I’ve created a new summer reading chart for the kids and they’re just as excited as me to use it. A summer reading program for kids can be so much fun and is a great way to encourage kids to love reading. Use this handy free printable for your kids and you’ll be amazed at how much they’ll read! Right click, save the image below, and print. Make sure your printer is set to “landscape” printing. Print one chart for each child and add their name to the top. You can even open the chart in PicMonkey and add the names using a fun font! There’s a few ways you can do a summer reading program and I recommend you personalize it for each child based on their reading skill level. My oldest, Nathan, is 12 and reads anything he can get his hands on. He’s also very fast, so it’s no big deal to read one or two novels in a day. On the other hand, Emily is a newer reader and it will take her longer to read a chapter book than her older brother. Joshua (he’s finishing kindergarten) is a beginner reader so he will also be on a different schedule than his siblings. And Luke isn’t reading at all, but I’ll be reading plenty of books to him this summer. Decide how many books you want each child to read in each reward tier. Nathan will have 10 books, Emily will have 2-3 novels or 5 shorter (level 3 or above) books, Joshua will do 5 of his short readers, and Luke will probably have 5-10 books read with Mom. Assign awards for each child. I recommend writing the rewards in the summer reading chart so the kids can see what they’re working toward. You could also use (affiliate links) stickers (an ice cream or pizza sticker, etc.) for more fun or even print and tape on some clip art pictures from online. To mark the kids’ progress as they read books, use stickers or avery dots (I had tons leftover from our move last summer). Or you could make a simple star or check mark with a colored marker. A summer reading program for kids can be so much fun and is a great way to encourage kids to love reading. Don’t think of it as one more thing to do this busy summer – the rewards themselves should be good incentive to get the kids reading without you needing to constantly remind them! And I’ve found that sometimes the mere fact that one child was close to reaching a reward gave my other kid incentive to read more! Whatever you do, summer is a great time to encourage kids to read and making your own summer reading program is a great way to do it! Want to track what books your kids are reading? 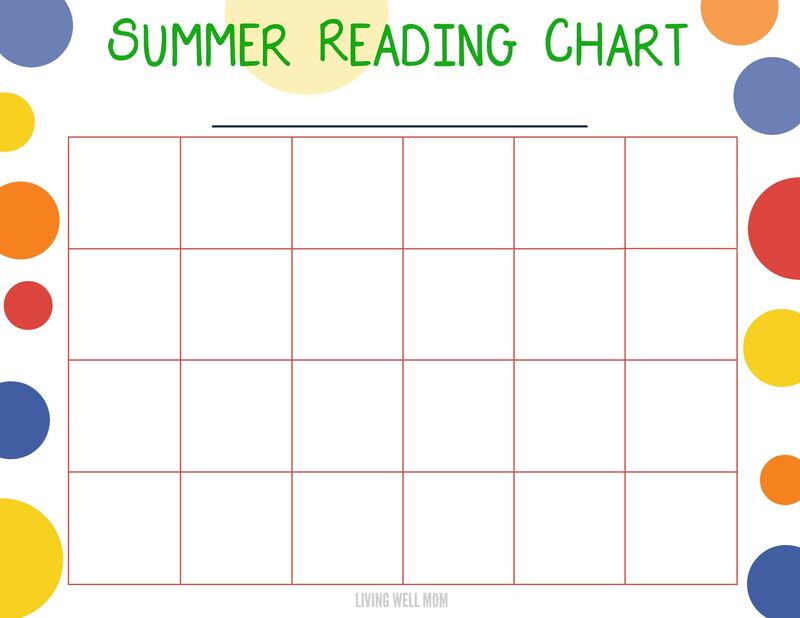 Download our free printable summer reading log set here! Here our kids get assigned summer reading from school, but this is awesome for those school systems who don’t do that. Giving kids a variety of activities like this throughout their summer break is a great way to keep their minds from turning to mush while they’re out of school. Making it fun, rather than tedious work helps them learn and they don’t even realize it. What a cute idea to get your kids excited about reading! My mom did something similar with us kids during the summer and I always loved it! I think summer reading programs are important. It’s important to keep your brain hard a work, even if you aren’t in school! This is an AWESOME idea and I think we are going to do this with our oldest! This would be very helpful for my girls! They need that extra boost to get them reading. Also, something you might add is that they choose their own books but that you or someone else (like grandma or big brother) gets to choose one of the books too. That way they expose themselves to new authors/topics that they might not have realized they would like. My kids have always loved to read. Even now as teenagers my daughter loves to go to the bookstore with me to see what she can find. I am totally printing this off for my little man. I need something to push him to read and this is perfect. We just purchased about four chapter books for him to start the Summer off with, so we are on our way, right? Thanks for the printable. A summer reading program is a great idea. It is so important for kids to keep their brain active during the summer vacation. That’s a really cool idea! It would be fun to come up with some cool rewards specific to your child’s tastes. This is such a great idea. Kids love to have a visual and to be rewarded for their work and this printable makes it so simple! This is a great printable. It is important to keep the kids reading over the summer break. This is great! I have been trying to get my son to read more. I will try this! I love this idea!! Summer time can be a struggle to get the kids into reading. I think my kids would really like this idea!! I started making my kids read at least 20 minutes before the T.V can come on in the morning. So far it is working out well. I LOVE this idea! We always do the summer reading program at our local library, but my kids are total book worms so they always blow through it! I can keep them going on our own program now! I love, love this! What a great way to keep the kids reading this summer! My son is going to 2nd grade so he will need to do a lot of reading to prepare for the next school year. Lucky for me, my kids have a strong natural ability to pick up reading. With 3 kids its hard to read to them and have them read, but I am always impressed at how much they grow. Reading is worth the effort, even if its less than you think is right, just do some reading and make your kids read too! 🙂 Happy summer! Wow I can’t believe your 12-year-old could already read so fast! 🙂 I think mine technically can, but just wouldn’t. 🙁 But with the help of this planner, I think I could get the kids to read more! And yes maybe I will capitalize on my kids’ competitive nature, like, make it a race or something? Do you think that would work just as fine? I love the idea of having summer activities with kid, I especially go to park for riding bicycle with my 2 daughters every summer and it is a memorable time always. Our library has a summer reading program which my family really appreciates. We also have a local bank that will open a savings account for children (ages birth -grade 12) and for every two books read they will put $1:00 into the account. Little ones who can’t read can be read to. My kids totally dig the idea of reading for money. As a mom of 10, it would be difficult to do this without help from my library and other local businesses that sponser the program. My boys will definitely be reading more this summer. Even though it is hard for them to put down their Xbox and tablet , they most get in some essential studying this summer. My kids totally dig the idea of reading for money, Really great idea. My sons will absolutely love this, they love to stay active. Thanks for the tip, i truly appreciate it.